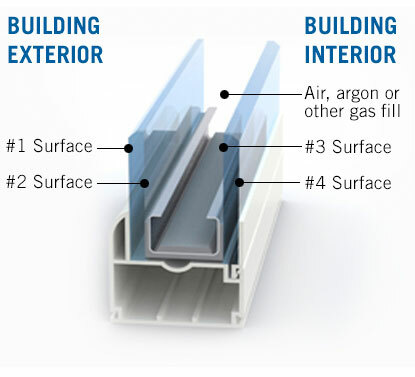 The Intercept® Spacer System by Vitro glass with “warm-edge” spacers, features a unique design that creates an effective thermal barrier at the edge of the IGU to help reduce conducted heat loss through the window, making them stronger and better at retaining insulating gas than many conventional designs. Using argon or krypton in the air space between the two panes of glass provides further insulation, as these gases are denser than air and less likely to let heat conduct through the IGU. Combined with a low-e glass coating, these gases work to improve the window’s overall u-value, which is a measure of the heat transmission through a building part (such as a wall or window). The lower the u-value, the better the insulating glass unit. When 90% argon gas fill is used in a low-e IGU instead of air, the window’s u-value can be improved by up to 16%. Similarly, krypton improves the u-value in a low-e IGU by up to 27%. However, using a noble gas instead of air in an IGU can add both time and cost to the window’s construction.